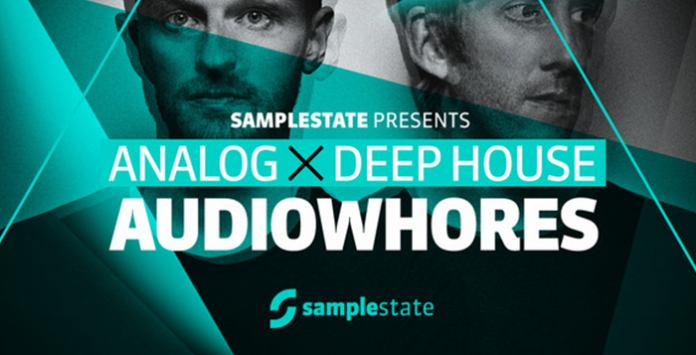 Samplestate proudly presents Audiowhores – Analog Deep House. 861MB of High quality samples direct from the studio of one of the UK’s finest production duos, namely Audiowhores. With huge releases on some of the worlds finest labels including Defected and Noir, and a busy international and UK tour schedule they need very little introduction. In 2012 the boys got their 1st Beatport top 5 with ‘Sometimes’ which was also Traxsource’s #1 downloaded track of the year. They achieved an incredible six number 1 hits on Traxsource in the space of 18 months, with their single “Facts’ featuring Stee Downes which smashed the top 5 chart on Beatport and enjoyed regular airplay on Pete Tong’s BBC Radio 1 show. This quality new product produced by Audiowhores includes, 196 fresh floor ready drums loops with kick free and stripped versions, nearly 165 music loops including chord loops, bass lines, pad loops, lead lines and guitars. Also included are some amazing session vocals, sax and flute recordings as well as 84+ essential one shot drum hits. All samples are in pristine 24bit wav/aif format, and the pack comes in either a standard wav pack, or alternatively an Apple Loops pack which includes all loops as pre analyzed aif’s perfect for use with Apple Logic Pro. Both versions include rex2 versions of the loop content.